This web page contains excerpts from the original BBB record for Debonair Marketing, a scan about Commercial Scouts, excerpts from parents, comments about all of the above, and a scan of a rebuttal by the principal of Commercial Scouts addressed to the BBB. My name is [dedacted]. My daughter and I were approached by a lady in the mall on Halloween night. She said that she was interested in my daughter and wanted to see her Sunday. (Nov. 2). She gave me a card with a business name of Commercial Scouts and her name on it. I have read the info on the website and am concerned if this agency is legitimate. Perhaps this company has had problems that may not exist currently. 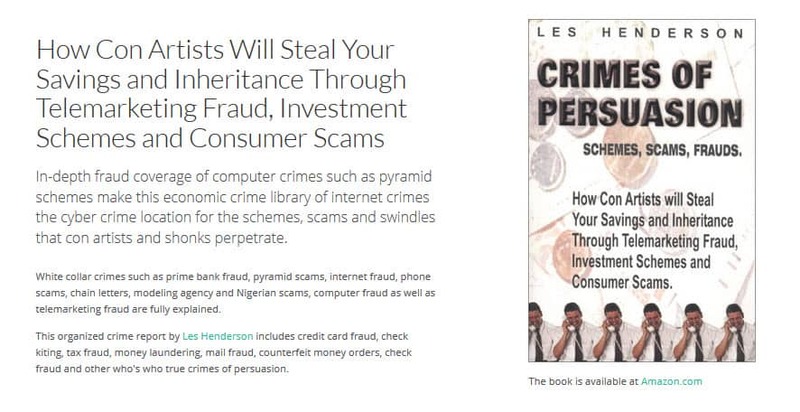 I do not have time or money to waste on scams. Please E-mail me back at [dedacted]@aol.com. There are so many scams going on today and I am trying not to let my daughter get too excited over this until I have a second opinion. Thank you so much for posting this information and I look forward to hearing from you. Thanks again. Commercial Scouts is not a talent agency. They have no talent agency license. If they said they are a talent agency, let you believe it, or you assumed they are, you are mistaken. The state database of licensed talent agencies has no record for Commercial Scouts. Therefore they cannot book your child work. They are extremely limited in what they can do for you in an industry which is extremely limited in what it can offer kids. The company now known as Commercial Scouts, formerly known as Debonair Marketing, may have mended its ways (if indeed they were ways it had to mend). At the time of writing, the BBB record for Commercial Scouts is clear, although it was just created. The BBB has expunged the record for Debonair Marketing; however, the original record can be seen below. There have been no complaints against Commercial Scouts received at the BBB or sent to this site. While the BBB record for Debonair was unsatisfactory, and complaints were sent by email, in fairness, it is possible there was a big misunderstanding. In any case, parents are now advised to proceed with caution, and be on the alert for any sales pitches, either from Commercial Scouts, or any group or company related to or affiliated with Commercial Scouts, at the time of the open call, or subsequent to it. The BBB claimed Debonair offered photographic services for kids; and consumers claimed online they were selling expensive acting classes. Watch out for those especially, or any upfront fees. This company's business is providing talent and photography services for children. Based on BBB files, this company has an unsatisfactory record with the Bureau. An unsatisfactory record is given when a pattern in the company's customer complaints causes us concern, when the company does not respond to complaints, or when it will not substantiate its advertising claims. A fax received ostensibly from Commercial Scouts about Commercial Scouts (see below) claims they do not charge fees. Yet, based on information from consumers, Debonair Marketing is linked with, or also does business as (dba), Commercial Scouts. Indeed, an individual identifying himself as Amir Khalatbari previously wrote a defense of Debonair Marketing. 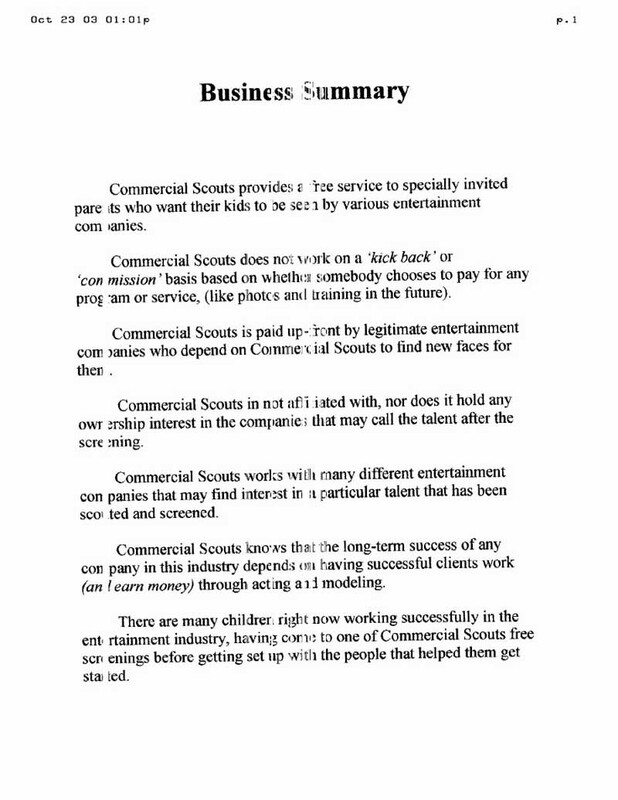 A person of the same name sent the fax of the Commercial Scouts Business Summary (as seen below). Debonair, according to consumers, charges or once charged $3,000 for classes, while using some kind of supposed screening process to "select" kids for classes in the manner of a talent agency. One consumer wrote about her daughter: "When it came to the crunch, they told me she needed acting school, and they needed $3,000." There is a conflict of interest here and that price tag is extreme. We are talking OUTRAGEOUS!!! A casting director in LA said acting classes run at $25-40/week. One consumer said an individual who claimed to represent a talent agency advised her to go to a Debonair screening. Earlier today my father and I went to Costco. We were in the shampoo aisle when a lady approached me and asked if she could speak to my father. She introduced herself and told me that she was with a talent agency. I was told that I was what they were looking for, that I was a shoo in. She then gave me an invitation to a screening that is happening this Sunday in Beverly Hills. I was very excited and very curious if I was just dreaming. After dinner, my curiosity led me to look up this so-called "Debonair Marketing." I then came across your website. After reading all the content regarding the agency, I don't know what to believe. Another consumer was also under the impression Debonair is a talent agency: "My friend suggested I should look online regarding the "Debonair Management" agency. I am glad I did! I read what a parent wrote regarding this agency." Therefore you can conclude Debonair is not a talent agency. Furthermore, it is all but impossible to believe a representative of a licensed talent agency would refer potential talent to a screening at another company, i.e., testing by anyone other than its own agents. However, the claims of the company appear to be other entertainment companies do contract them for casting. But the names of these particular companies have been not been provided. This is something consumers would have to confirm in advance. 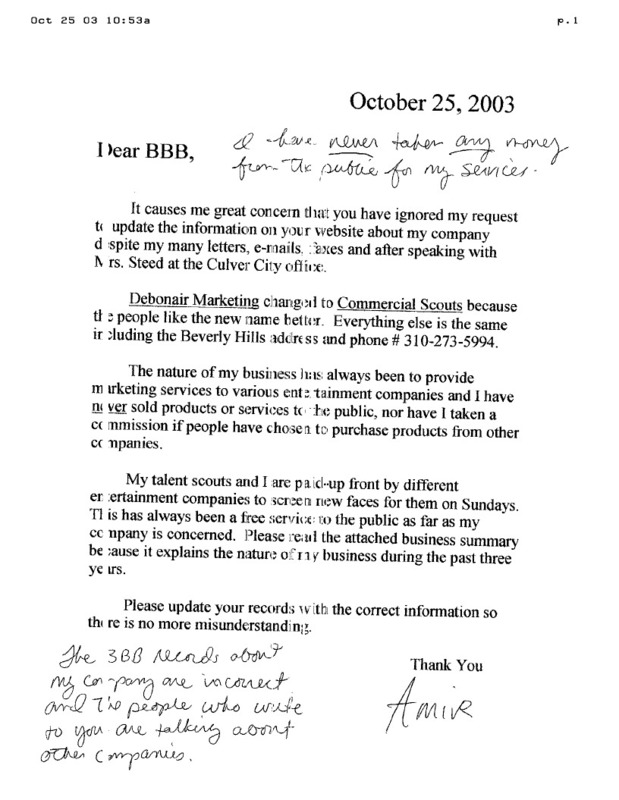 Below is a copy of a fax apparently submitted to the BBB by Commercial Scouts alleging inaccuracies in the BBB record. If products (photos) or services (training) have indeed been provided by Debonair or Commercial in the last few years, consumers are asked to fax copies of their invoices. At the end of the day, if consumers are not asked by anyone to pay any fees, either to Commercial Scouts, or a company referred to them by Commercial Scouts, there is probably little about which to be concerned. My child was approached at a store recently and we were given a card for a special "screen test" being held on a Sunday at 9713 Santa Monica Blvd. There were several hundred kids there, all were put on camera and then were asked to say their name and were then asked to say, "I love McDonald's." They were then sent to two men standing off to the side, and had a short interview. My child was then chosen to go on and meet another representative in Room 221. The woman in the room was the stereotypical "agent" type. I think she may have studied the character of "Joey's agent" on "Friends" because she was the epitome of a woman in her 60's, New Yorker, fast talking, gruff, and tried to be a little intimidating. She told us that, out of all the children to come through, only about 20 would make it through her door and, out of those 20, only five or six would make it to the final round. She said she would review the videos of the 20 she had seen and give us a call if she thought our child would have a shot at a career in the entertainment industry. All of this drama was lost, of course -- my child is only five -- and had no idea what the "entertainment industry" was or is. I, of course, was suspicious and a little amused. The whole office looked like a movie set, a bad one at that. Autographed posters on the walls, headshots on her desk, all signed, of course. It was rather ridiculous! My husband asked her if she was an agent, and she replied that she was a "consultant for the larger agencies," and that she essentially helped them find new talent. The kicker, which I had been anticipating, was that their fee: $2,500. They would prepare our child to meet all these agents at a show in February. This fee would cover acting classes, headshots, videos, etc. My husband politely told her we were not interested and hung up. I would really appreciate you looking into this company. They are bordering on [...] business practices, and are [...] many hopeful kids and parents. Please pass this information on, so that the appropriate action can be taken. At least let it be read by other parents in order to inform them ahead of time so that their children aren't subjected to the rejection and heartbreak when they learn this is just a [...]. My daughter and I were approached in our local Target store tonight by a woman from Commercial Scouts. She asked us to come to Beverly Hills on Sunday, said that we did not need to bring any money, not even for parking, and she repeated this at least 3 times. She said that the audition would not take long and we'd be out of there within a half an hour. Of course, my daughter is very excited and wants to go. We were told to go to the same address as the Debonair Marketing address. We were wondering if there were any new reports on this company.